The most effective way to lose weight and gain your health! 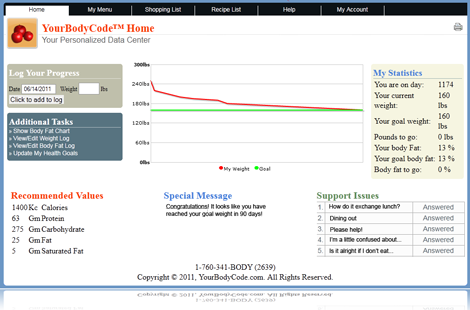 YourBodyCode.com is an online diet and nutrition program that is customized to each individual to enable to you to lose weight, gain your health and build healthy muscle all while actually enjoying what you eat. Learn More | What does the program cost? Sign up to receive our free newsletter with tons of helpful tips on how to gain and keep your health. The No Gimmick, Personalized Plan to Your Health, Fat loss and Wellness - The last diet - or lifestyle change you will ever need to keep the results for life. I have spent the last 20 years restoring health and wellness to thousands of people using common sense and scientific nutritional methodology!